Since the morning low tides were occurring this week I decided to take the day off from work and see if the Bald Eagle action was starting to heat up. 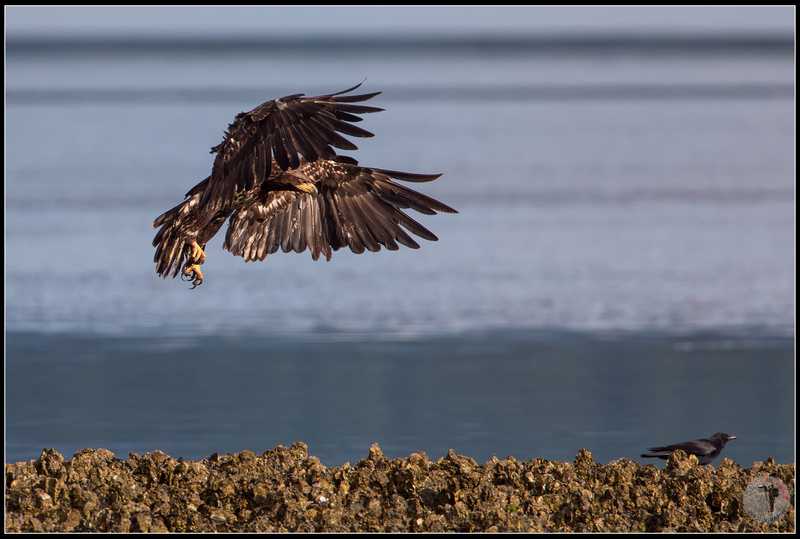 It was a nice clear sunny morning on Hood Canal, so tide and light conditions were favorable, all we needed was for the Eagles to come out and play. I arrived a little late as the flight action seemed to already be underway, but still with few more hours to go before the minus tide hit slack. The slew of photographers on the beach seemed to outnumber the Eagles. I had a good hour or so with the birds actively soaring though the area to feed on the Midshipman fish exposed on the beach. It didn’t take long for them to settle down to devour their catches but at quite some distance away with the minus tide. Here is one the shots captured during the fairly productive although somewhat slow morning. Processed with Lightroom CC, Photoshop CC, Nik ColorEfx. To see a larger version please click on the image. Feel free to comment below if you like what you see or have any other observations.